Maybe one should always beware plays with letters as cast members. It never bodes well. E V Crowe has been steadily building a reputation as a writer of taut, stringent control since her debut, Kin (2010) followed by the positively garrulous (by her standards) but impressive Hero (2012) with Daniel Mays. Last year, Brenda, a study in mystery and abuse, premiered at the High Tide festival and certainly took no prisoners. Nor does her latest, The Sewing Group. Think pre-industrial, close-knit, claustrophobic community, lit by candles. 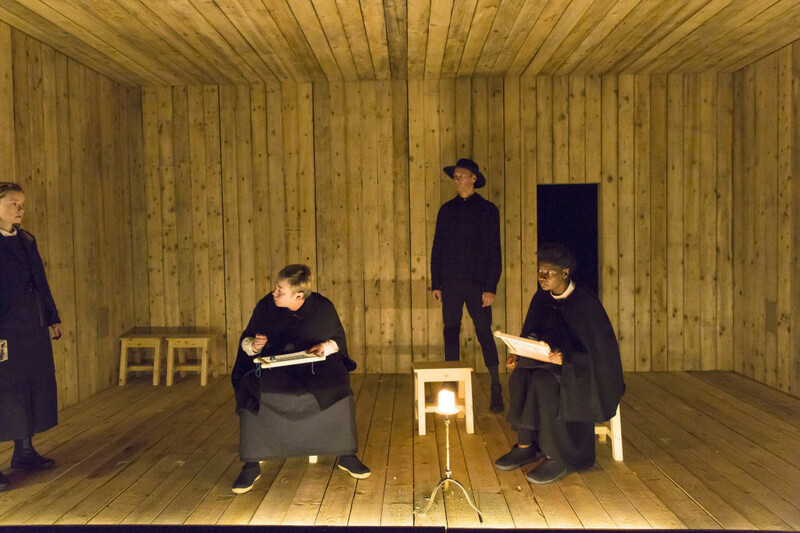 No, not the opening to Ella Hickson’s terrific Oil (currently at the Almeida) with a similar starting point, but in Stewart Laing’s close-cropped wooden house setting, evoking the atmosphere of Arthur Miller’s The Crucible. 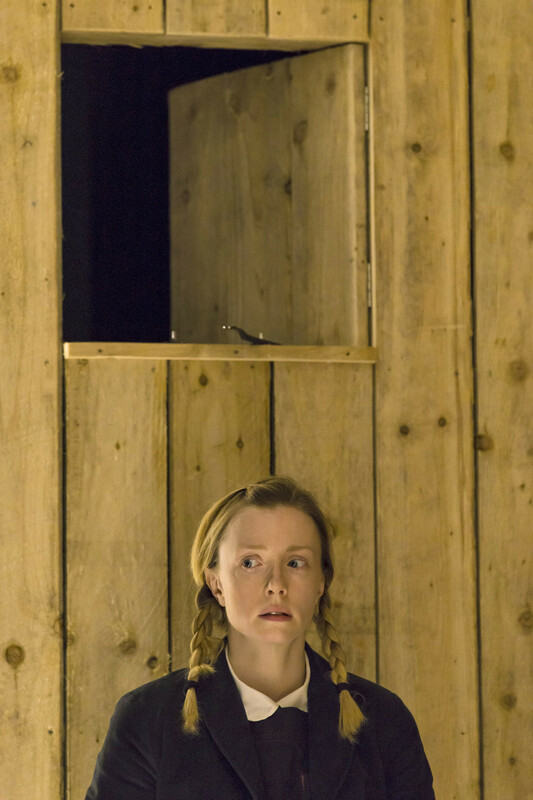 At least, that’s what I was half expecting only to find my expectations fiercely overturned which is exactly what theatre sometimes should do. Shake us up, refresh our ideas. The problem is, having overturned them, The Sewing Group then proceeds down what is becoming a rather well trodden path – that of modern day and especially technology’s effect on our lives. Crowe does at least take it a few steps further by suggesting that in an effort to offset the speed and mental aberrations to which computerised life is creating in us, corporations are investing in `time out’ exercises for their senior staff of a macabrely fanciful fashion – nothing less than retreats into fantasy worlds. Ironically, The Sewing Group is at its most intense in its faux-recreation of a sewing group in what looks like a strict, Puritan led village, less convincing when reflecting the present. But isn’t that the way. The past is so much safer! As a suspense tale it works very nicely and as a study in form and style, silence punctuated by sharp[ one-line dialogue, it builds momentum. But once the cat is out of the bag, and the illusion broken, tension flags. There are some lovely controlled performances from Laing’s cast, especially John Mackay, a benign version of one of The Crucible’s starched religious zealots, Nancy Crane as another elder and the quartet of sewing ladies, Jane Hazlegrove, Sarah Niles, Alison O’Donnell and Fiona Glascott’s cuckoo in the nest, Maggie – a character designed to reveal female ambition at its most steely and hard. Like her creator, `C’/Maggie takes no prisoners. Stylistically intriguing, in the end, the conceit, sharp enough in itself, doesn’t carry quite enough fire power in its conclusion. A bit of a curate’s egg, no doubt there will be more to come from Crowe. This review first published on this site, Nov 19, 2016. 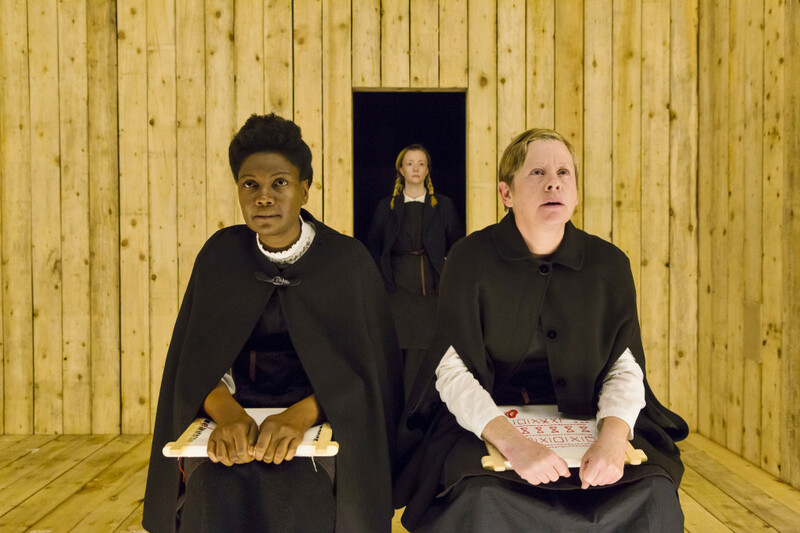 This entry was posted in 2016, Reviews and tagged Alison O'Donnell, corporate games, E V Crowe, fictional past versus time-pressed present, Fiona Glascott, Jane Hazlegrove, John Mackay, Nancy Crane, Royal Court Jerwood Theatre Upstairs, Sarah Niles, Stewart Laing on November 19, 2016 by Carole Woddis.